The massive wildfire raging in Fort McMurray shows no signs of abating as winds push it to the southeast. The fire has grown to 85,000 hectares and a provincial state of emergency was declared Wednesday. Alberta Premier Rachel Notley implored Albertans to be “extremely careful” in the region as fire conditions remain extreme throughout. Notley said there are 49 fires burning in the region, with 18 new wildfire starts since Wednesday. 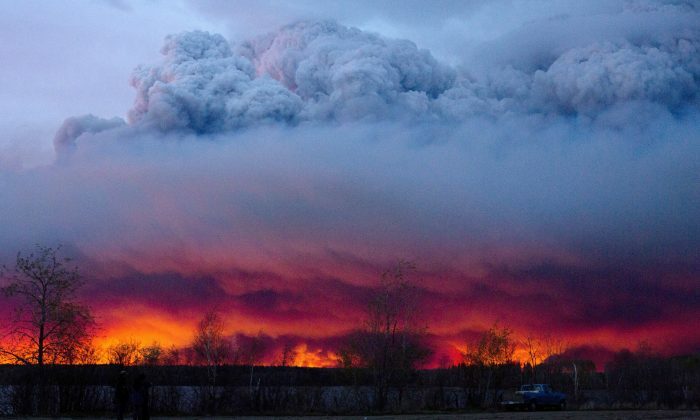 More than 80,000 people have been evacuated from Fort McMurray and the surrounding areas. “I want you to know, we have your back,” Notley said at a Thursday press conference live-streamed. She asks for everyone who has been displaced to register with the Red Cross by calling 1-888-350-6070 or at a local reception center. The Red Cross has been assisting with the evacuations and has so far raised more than $11 million for the fire victims. Notley said people can call 310-4455 with wildfire-related questions. “Whatever road we face, we will face them together,” she said. An evacuation is underway for 25,000 people who are north of the city—the goal is to get them south as quickly as possible, Notley said. Some will be transported by air and the rest will travel via roads once they are safe. Chad Morrison, a senior wildfire expert said they’re still investigating the cause of the fire, which started in a remote part of a forest. However, he said most fires are started by humans and are preventable—urging people to be careful.